🌊 A fast and friendly non-hydrostatic ocean model in Julia that can be run in 1-3 dimensions on CPUs and GPUs. A fast non-hydrostatic ocean model in Julia that can be run in 2 or 3 dimensions on CPUs and GPUs. The plan is to develop it as a stand-alone large eddy simulation (LES) model which can be used as a source of training data for statistical learning algorithms and/or embedded within a global ocean model as a super-parameterization of small-scale processes, as in Campin et al., 2011. Our goal is to develop friendly and intuitive code allowing users to focus on the science and not on fixing compiler errors. Thanks to high-level, zero-cost abstractions that the Julia programming language makes possible, the model can have the same look and feel no matter the dimension or grid of the underlying simulation, or whether running on CPUs or GPUs. Note: We recommend using Julia 1.1 with Oceananigans. 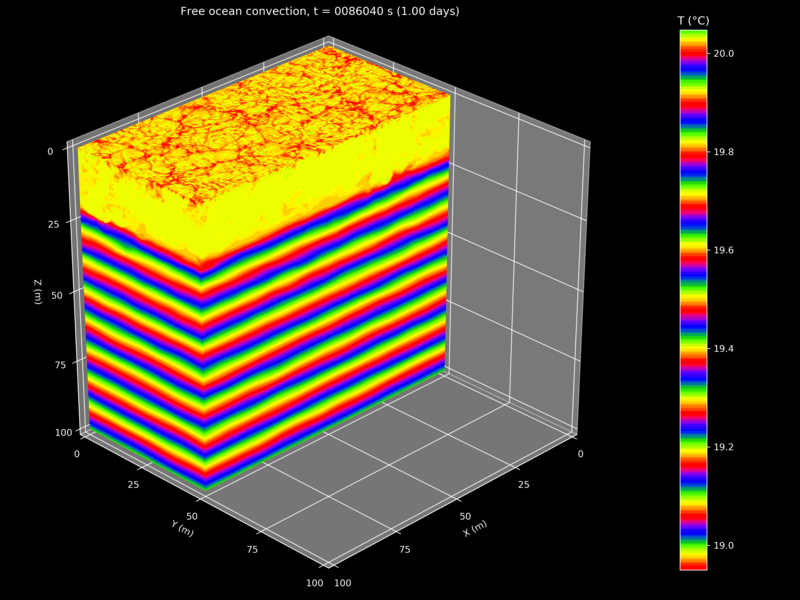 Let's initialize a 3D ocean with 100×100×50 grid points on a 2×2×1 km domain and simulate it for 10 time steps using steps of 60 seconds each (for a total of 10 minutes of simulation time). Nx, Ny, Nz = 100, 100, 50      # Number of grid points in each dimension. Lx, Ly, Lz = 2000, 2000, 1000  # Domain size (meters). Nt, Δt = 10, 60                # Number of time steps, time step size (seconds). 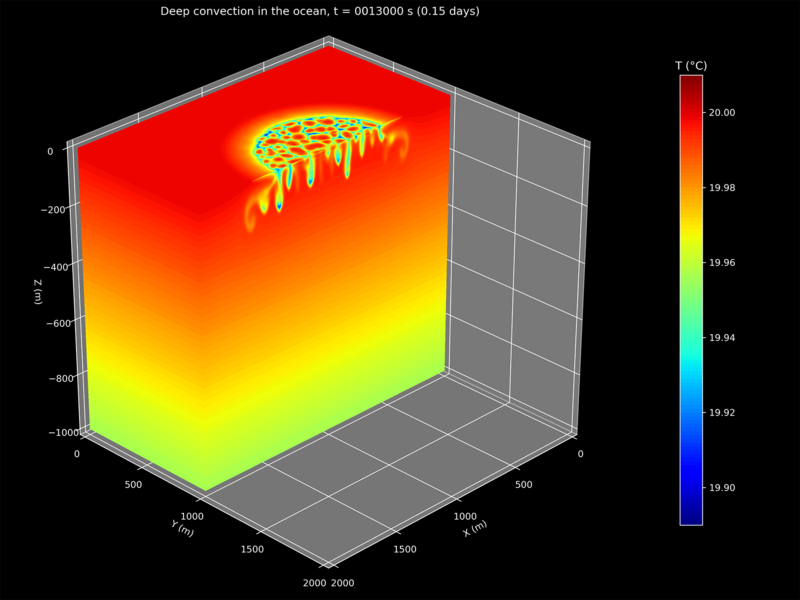 You just simulated a 3D patch of ocean, it's that easy! It was a still lifeless ocean so nothing interesting happened but now you can add interesting dynamics and plot the output. Let's add something to make the ocean dynamics a bit more interesting. If you have access to an Nvidia CUDA-enabled graphics processing unit (GPU) you can run ocean models on it. If you are interested in using Oceananigans.jl or are trying to figure out how to use it, please feel free to ask us questions and get in touch! Check out the examples and open an issue if you have any questions, comments, suggestions, etc. We've performed some preliminary performance benchmarks (see the benchmarks.jl file) by initializing models of various sizes and measuring the wall clock time taken per model iteration (or time step). The CPU used was a single core of an Intel Xeon CPU E5-2680 v4 @ 2.40GHz while the GPU used was an Nvidia Tesla V100-SXM2-16GB. This isn't really a fair comparison as we haven't parallelized across all the CPU's cores so we will revisit these benchmarks once Oceananigans.jl can run on multiple CPUs and GPUs.